practising if he is to reach the qualifying distance of 8 m 10 cm. His current best jump is 7 m 90 cm so he only has 20 cm to go. The children asked some great questions—Matthew’s opener was “Do you have a six pack?” but others asked about his previous experience, his training and his diet. The children all took part in their sponsored activities which left them completely out of breath and very tired. Some members of staff tried to join in but quickly realised how long a minute is when you are doing ‘Star Jumps’ or ‘Spotty Dogs’! 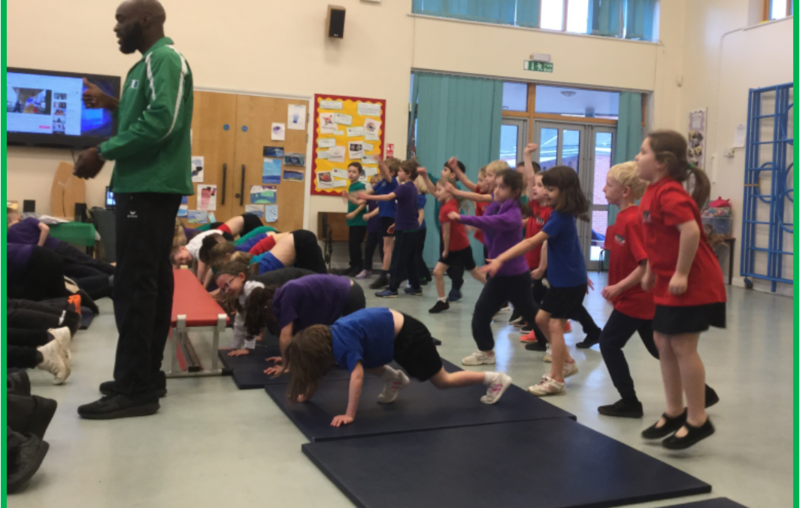 During our assembly Zek persuaded some children and some members of staff to try a standing long jump. Mr Ray and Mrs Bennie did a fabulous job, as did the children, but they were all well and truly shown up when Zek launched himself high in the air and flew across the hall. We really enjoyed this visit and between us raised over £800 some of which will go to our PSA and the rest of which will be used to support a range of athletes with their training.